You get free-of-charge support and technical advice directly from our local partners. 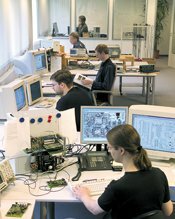 For any more extensive questions and support issues, our design and production team in Grosshansdorf, Germany is ready to assist you and answer your inquiries. All of the products from Spectrum are “Made in Germany” – from design to production! – fulfilling the highest quality standards. Software updates are available free of charge for the product's lifetime. The current version is always available for download on our homepage. Our standard warranty is for 5 years. We will supply products as long as required, even if they are no longer included in our catalog or on our homepage. For example: We continued to sell ISA boards that were developed in 1991 until 2008 to satisfy long-term customer's projects. The modular structure of the cards and the years of development expertise at Spectrum allow us to make custom specific changes to the cards to match your particular application requirements. Whether you need special high-accuracy quartz clocking,different input ranges, advanced trigger functions or even additional output signals - just discuss your needs with our design team.